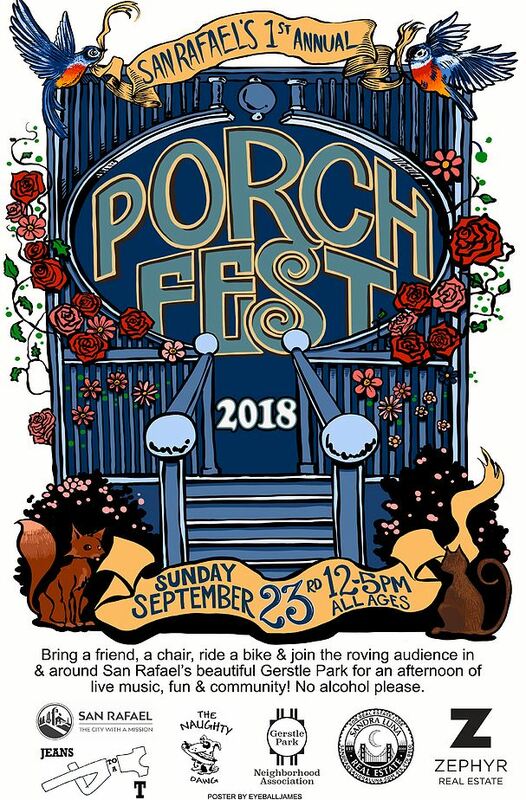 The first San Rafael PorchFest is happening on Sunday, September 23 from 12 p.m. to 5 p.m. in the Gerstle Park neighborhood of San Rafael. It will be a day of free music performed on 20 porches by 40 performers. Some streets in the neighborhood will be closed to traffic, so bring a friend, a chair, ride your bike and enjoy a fun afternoon of local music and community. There will be food trucks at Gerstle Park (San Rafael Ave./Clark St.) as well as pupusas and ice cream for sale at Short School (Marin St./Bayview St.). Please join us and tell your friends about San Rafael PorchFest.